Great compensation options and employee perks! I have been working at absolute spa for seven years. I think that it’s phenomenal place to work at. Everyone here is very friendly; it is a very fun and warm place to work at. It really feels like we are one big family here at absolute spa. I like the group benefits plan and product discounts. The estheticians here receive training when hired. I am very proud of our spa because the company gives back to the community. For example the company helps raise money for various charities. Another cool thing about working at absolute spa is that celebrities come and I get to meet them. I am very happy and proud of working at a five star spa and of working for the largest spa chain in Canada. When I was considering becoming an RMT I had a meeting with a manager at Absolute Spa. She was very friendly and answered all of my questions about the job and the industry. I decided to do it and when I graduated, I came to Absolute Spa and I love working here! Work at Absolute Spa as a RMT offers more advantages to me and my clients especially when first staring out. Having access to the pool and stream room has been beneficial to many of my clients in their treatment. They are able to relax and enjoy the amenities before and after their treatment and not feel rushed out the door. It’s nice to be able to come to work and pick up my schedule and start my day knowing that I don’t have to worry about making bookings, collecting billings, and doing laundry. I can spend my time were it should be, with my clients. The highlight of working at Absolute Spa, and with Youngblood cosmetics, is inspiring women to choose healthier makeup that looks amazing and cares for their skin and health daily. Working for Absolute Spa at the Fairmont Hotel Vancouver as been one of the most uplifting experiences I’ve had yet! 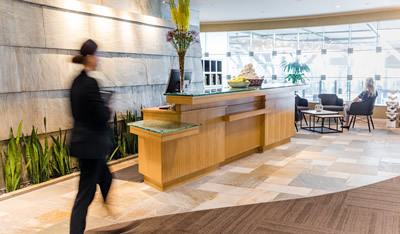 Recently graduating from Blanche Macdonald and coming into such a big spa was extremely intimidating but our team made the transition seamless and natural, offering more support than I could have ever hoped for. I enjoy doing gel nails with a lot of bling and A LOT of nail art as I’m always up for the challenge of trying a new design. I have a true passion for beauty and everything that I do, and I couldn’t be happier working at Absolute Spa. There is such a wonderful atmosphere here and you can tell how happy everyone is in helping each individual client with their needs. Everyone is always uplifting and positive with smiles on their faces, I love coming to work here everyday knowing we have a wonderful team… “I wouldn’t work at any other spa” If I had to pick one service, I would pick one of our wonderful Absolute facials! At Absolute Spa we customize one of our amazing facials to our guests needs and skin type. I like to educate my guests on use of our products so they may continue their experience for their home care. I started working with Absolute Spa 5 years ago as a make up artist and front desk concierge. Over the years I have been promoted to supervisor and eventually managed the Absolute Spa Park Royal location. I have had the pleasure of working the ESI trade shows as a make up artist for Youngblood Mineral Cosmetics and special charity events that Absolute Spa hosts. I am happy to work for a company that gives you room for growth, promotes within and always has you learning. My current position is Spa Manager at the Fairmont Hotel Vancouver Property, and I am excited to see what’s in store for the future. I graduated from Blanche Macdonald with a diploma in Make- up artistry in 2003. Soon after completion I started my career as a Make Up artist using Youngblood Mineral cosmetics at the Absolute Spa Group. I absolutely loved my role! I loved working hands on with guests and giving them a fresh face to go home with. 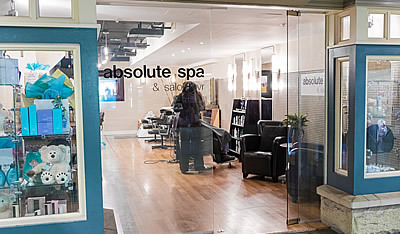 About 6 months after I was hired Absolute Spa was just opening a new location at Hotel Vancouver. This was set to be Canada’s first “Men’s Concept” spa! I was offered the opportunity to help out the manager at this location as a front end coordinator. At the time I was unsure if I wanted to step away from my make up position having been a recent graduate and wanting to keep up my new craft! It was 100% the right decision for me to make. 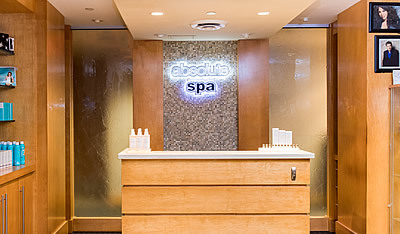 Soon after my concierge position at the Hotel Vancouver location I became a Spa Supervisor. From there I was promoted and managed the Century and Airport locations for over 4 years. From there I was involved in all the buying and operational duties to open the Park Royal location. I then worked as Operations manager for 2 years over seeing all 11 locations. From there I was promoted to Sales Manager with the absolute spa’s sister company – Soluzione Spa Products. I oversaw all aspects of distributing 9 high end spa product lines to over 18,000 accounts across Canada. Over my 3 years with Soluzione I also learned a lot about product development and production, sales & marketing, negotiating pricing and contracts. Most recently I am now back in a spa role and over our 2 largest downtown locations and oversee a team of approximately 100. The growth potential is truly endless if you put your mind to it. • Traveling to over 15 spa shows across Canada & US- Toronto, Montreal, Calgary, Edmonton, Nova Scotia, New York, Las Vegas & Florida. • Absolute Altruism- Volunteering my time at events benefiting several different charities including: Pacific Family Autism Center, Variety the Children’s Charity, CHILD Foundation, BC Cancer Society, Canadian Breast Cancer Foundation. • Ladies Media Golf Classic- I have been a volunteer for the last 5 years, The owner Wendy has raised over $3 million to support B.C special children. I like working with Absolute Spa Group because of the great management. The scheduling is flexible which helps me out as I have a small child at home to take care of. I especially enjoy working at the YVR locations because of all the different aspects that the airport brings to the work place. I like working with the Absolute Spa Group because of the flexible scheduling and the great hours. The training opportunities are great and it is always fun to learn about the 5 star products we carry. I like working for the Absolute Spa Group because I like the products that they carry. These products are why I feel our guests keep coming back to us. The Owners and Management have a very positive energy and are approachable when wanting to learn more about the spa business. 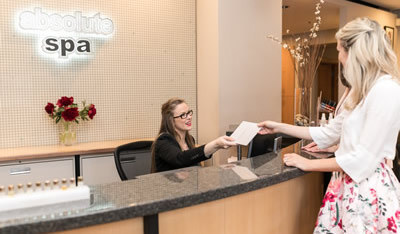 Absolute Spa has great staff to work with and the management team is well put together. This makes for a great and enjoyable work environment.